The new Harvest Moon puzzler hits the DS this month! It's a Harvest Moon puzzler! 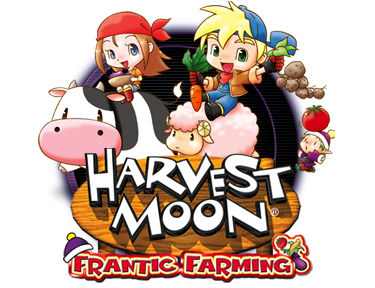 After a string of Harvest Moon titles for various consoles over the years, Natsume is now taking a turn at creating a puzzle title built around the Harvest Moon theme with their upcoming DS release Harvest Moon: Frantic Farming. While we're not sure how the game will go over with long-time fans of the series, judging from the new gameplay trailer, it definitely looks interesting and could end up being a great addition to the growing DS puzzler library of titles. You can check out the official press release below along with the brand new gameplay trailer and screenshots below. Natsume Inc., a worldwide developer and publisher of family-oriented video games, announced today that Harvest Moon: Frantic Farming has entered into manufacturing and will launch in August for the Nintendo DS. Set in the world of last year's DS hit Harvest Moon: Island of Happiness, Harvest Moon: Frantic Farming continues the tale of the island and its residents. Something strange is happening on Sunny Island! Crops are popping up everywhere and growing out of control! If something isn't done soon, the once-tranquil island will be buried in an avalanche of vegetables! It's up to the players to solve the mystery of this produce predicament as they try to tame the crops and gather as many vegetables as they can! "We are eagerly anticipating the launch of Harvest Moon: Frantic Farming," said Hiro Maekawa, President and CEO at Natsume. "We know that players will enjoy the wide variety of gameplay modes, playable characters, and fun unlockables that we have planted in this all-new adventure!" Players can choose from 12 playable characters, each with their own unique story and abilities. See how the mystery unfolds from each character's perspective, and which Harvest Moon characters they meet along the way! The game features a variety of modes including Story Mode, the brain-teasing Mission Mode, and the action-puzzle excitement of Score Attack and Free Play Modes. Players can test their farming skills against their friends and family in Multiplayer Mode, and even play against people who don't have the Game Card via DS Download Play! Players can also unlock character art, music, and some special surprises in the Collection Room. Harvest Moon: Frantic Farming will ship to retail in August. Harvest Moon: Frantic Farming is rated E for everyone by the entertainment software rating board (ESRB). We'll have more information on Harvest Moon: Frantic Farming as it becomes available, as well as a full review when the title is released on August 26th. Why did they announce the release date now? They should have done this a while ago. Who knew that this was going to happen? Too early for release! YAY! me , myself is a Fan Of The Harvest Moon Series! it's amazing this franchise is still around, seeing as it went downhill after Harvest Moon(SNES) which is an awesome game by the way. This is a puzzle game? Actually, it's the second Harvest Moon puzzle game. Puzzle de Harvest Moon came before it and it was given some abysmal reviews. But when will we get Rune Factory 2 on DS and Rune Factory Frontier on Wii in the UK? TELL ME! I just bought my niece Rune Factory 2 for DS. She's played it non-stop ever since. She's like a Harvest Moon/Rune Factory freak. @Prosody Rune Factory Frontier is coming to the UK in October , as for Rune Factory 2 the release date hasn't been announced. Frontier is one I'm highly looking forward to. Just to rub some more salt into that wound: Rune Factory 3 is already on track for release in Japan later this year. @Prosody: I'm sorry that you guys have to wait so long for Rune Factory: Frontier! This is exactly how I felt when waiting to play Little King's Story! Hang in there good sir! It is a great game and will be worth the wait! @WolfRamHeart I'm sure it will be. You lucky people! anyone else found that amusing? speaking of the game itself.... why puzzle? I was excited until I read the word "puzzle". Now I could care less.